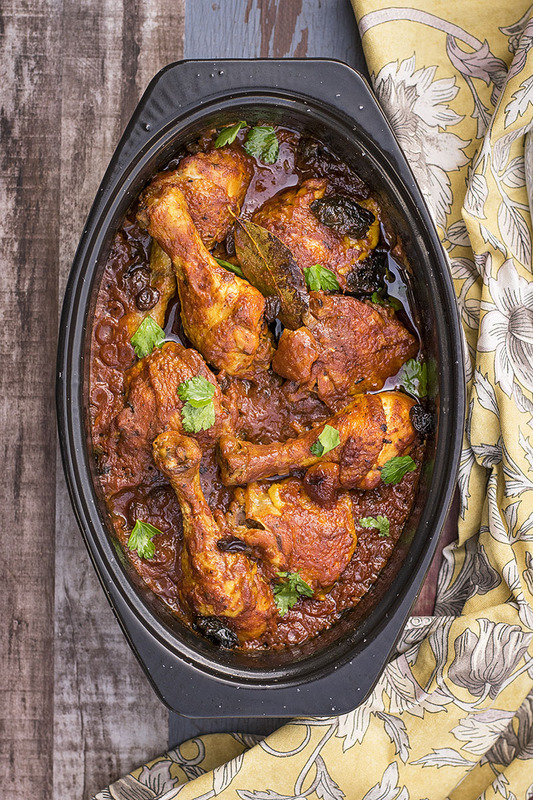 Make your own ras el hanout spice mix and enjoy this Moroccan chicken baked in a spicy tomato sauce for a cozy (and gluten-free) dinner! 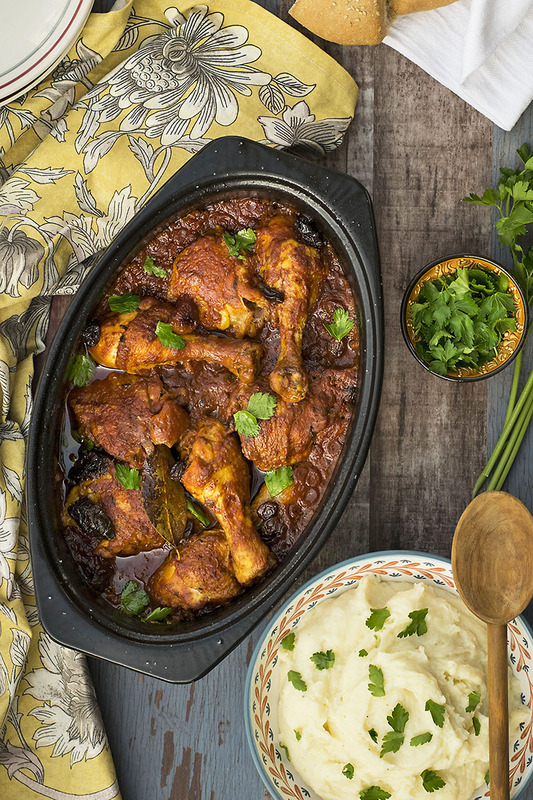 This Moroccan chicken with 11 spices is one of the most beloved recipes in my home! It is a very fragrant, full-flavored (and gluten-free!) dish. I know that eleven spices may seem a lot to some, but they’re really not! What happens is something like a synergy, where every spice interacts with the other creating a full-bodied, deeply flavorful, scrumptious and cozy dish and all this without the intensity of the spices being overwhelming. And though you’ll get the best results by sauteing the chicken and then baking it in the oven, you can also finish cooking it on the stove, just like a stew. And speaking of Moroccan recipes, I must tell you I’ve also made a Moroccan rice (pilaf) (you should definitely check it out!). 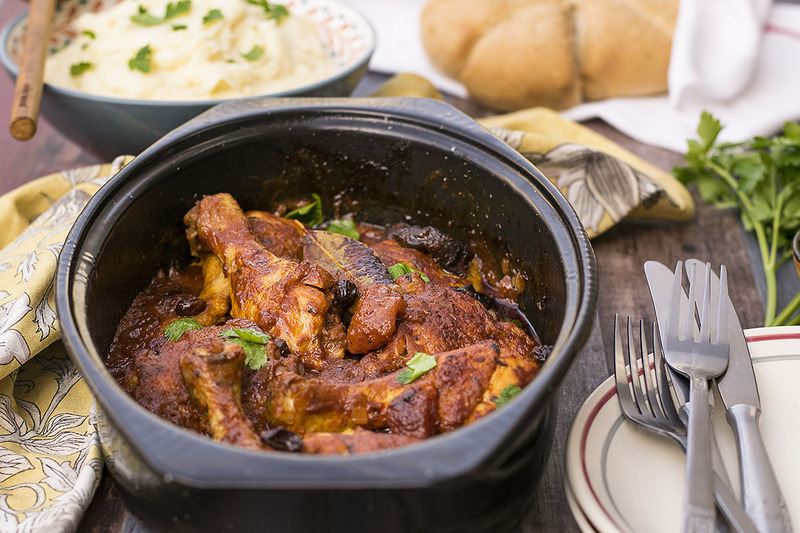 But I suggest serving this chicken with a simple side dish like mashed potatoes, simple fluffy rice or spaghetti, just so it can get mixed and absorb the deliciously spiced sauce of the chicken. Ras el hanout is a Moroccan spice blend and its’ name means “top shelf”, or “the best of the store”. In other words, it is considered to be the best mix of the store, and every vendor or family have their own mix. So the exact flavor of ras el hanout depends on where you buy it from. Most often, it contains 12 ingredients, but you can find mixtures that contain more than 20 different spices or even 100 (apparently there are a lot of spices out there!). For this recipe I like to use 11 spices, most of them are commonly used in Mediterranean and eastern cuisine. Most of these spices have a sweet, warm and earthy aroma and compliment one another. One or two bay leaves are also thrown into the pot and some dried fruits are added 15-20 minutes before the end of cooking time just to make things more interesting! (if you add the dried fruits from the start they’ll become way too soft). 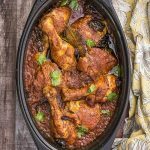 Another example of a recipe where the chicken is cooked in a flavorful tomato sauce is this Whole chicken cacciatore stew with bucatini pasta, an Italian, hearty dish loved by a lot of people! Pat-dry the chicken pieces very well before sautéing them, otherwise the oil will splatter everywhere! (If you notice it starts to splatter, just cover the pot with a lid). 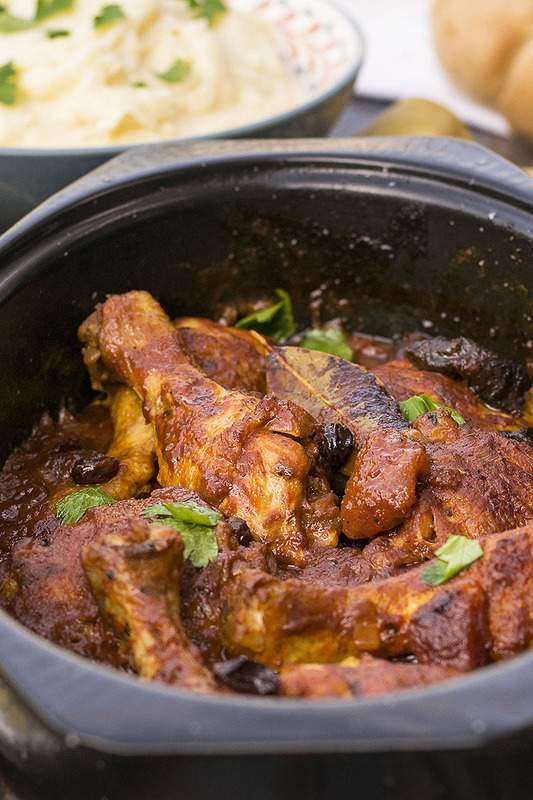 You can cook this dish on the stove, with the pot covered, like a stew. The outcome will be just as flavorful! Other spices and herbs you can use: dried tarragon, rosebuds, mace, allspice, thyme, lavender, cayenne, pink peppercorns, green peppercorns, star anise…. Pat-dry the chicken pieces very well with paper towels and preheat your oven to 390°F (200°C). Heat a dutch oven or a heavy-bottomed saucepan over high heat, add the olive oil and the chicken pieces in one layer (do it in batches if they don’t fit all at once) and sauté until browned from one side. Flip the chicken to brown from the other side and transfer to a plate. Reduce heat to medium and add the onion, garlic, bay leaves and the spice mix. Stir and cook the mixture until the onion is soft (3-4 minutes). Transfer the chicken pieces back to the pot, add the pureed tomatoes and the salt, stir and let it come to a boil. Cover the Dutch oven with the lid, or transfer the food to a casserole and cover firmly with foil and bake in the oven for 50-60 minutes. After 30 minutes of baking add the dried fruit over the chicken and shake the casserole gently to distribute. 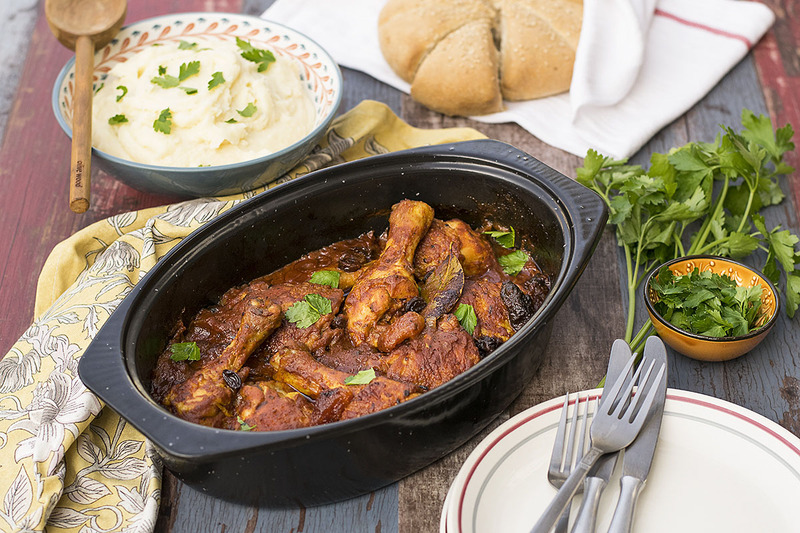 When the chicken is done, sprinkle with chopped parsley or tarragon and serve with rice, mashed potatoes or spaghetti. What a heavenly dish..I could stare at these pictures forever. The spice mix looks wonderful, similar to Indian cuisine actually. Pinned 🙂 !!! Very fragrant and tasty recipe! It came out delicious!